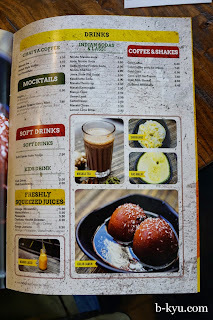 An edumacation in Indian street food at Chatkazz, Harris Park. Our token westie friend (joke) invites us to the biggest queue in Harris Park. 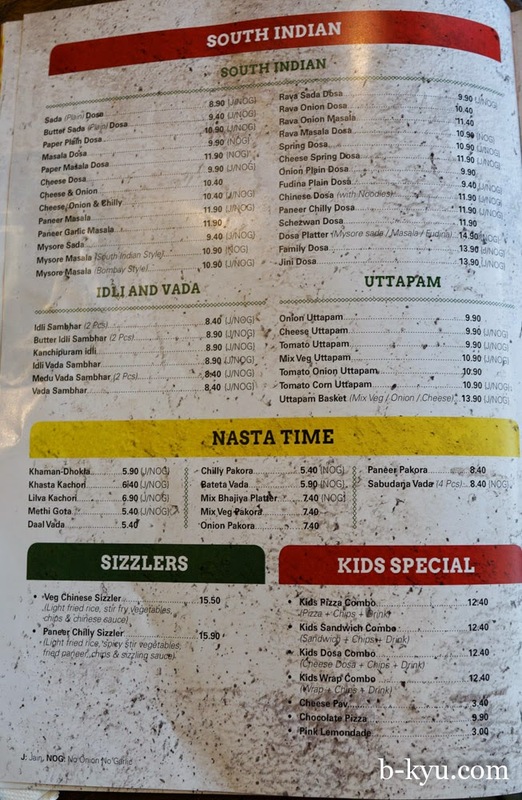 We snag a table and we're happy to see a menu full of mystery. 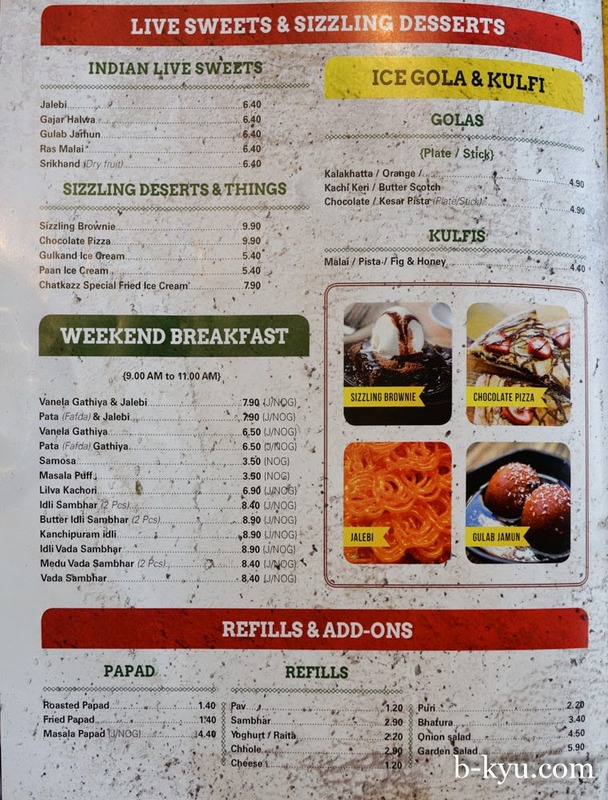 Only some dishes have menu pictures so we wing it hard. 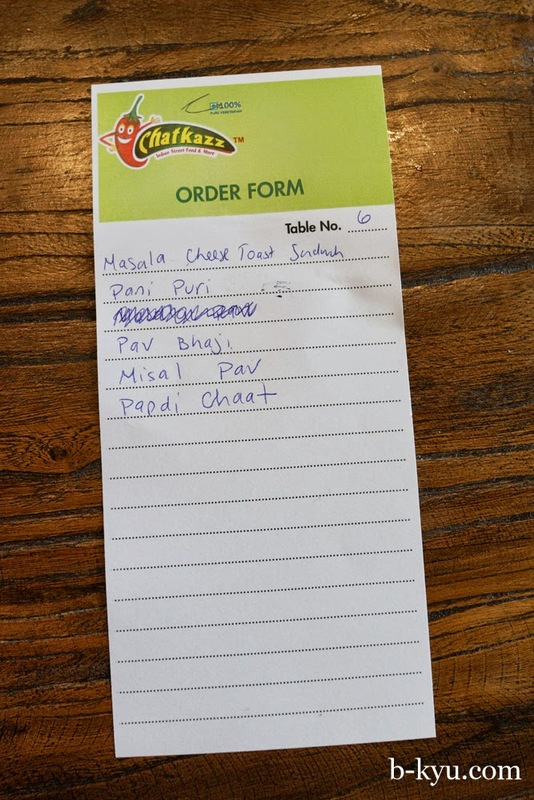 Sensible people would have Googled the dish names, Wikipedia has most of it covered. 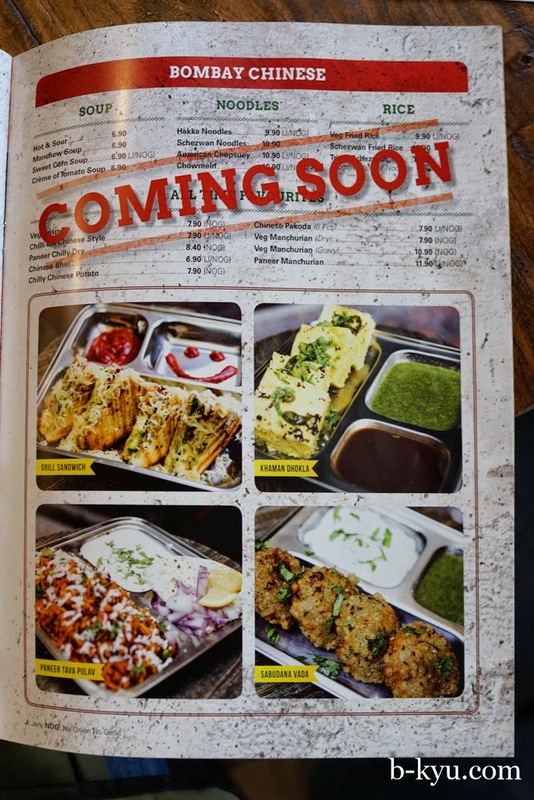 Later, when looking up the dishes on the net, we realised how little we know about Indian street food, not even the bare basics. Shame on us. Chatkazz seems like a pretty good place to learn. 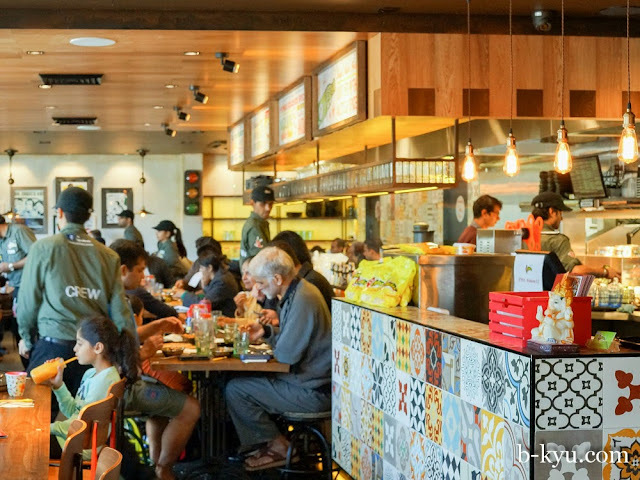 Chatkazz has all the hallmarks of the new breed of eating houses across Sydney, faux retro pictures on the walls, retro looking light fittings and distressed furniture, crazy mixed up colourful tiles on a long bench and an appearance of highly organised service. 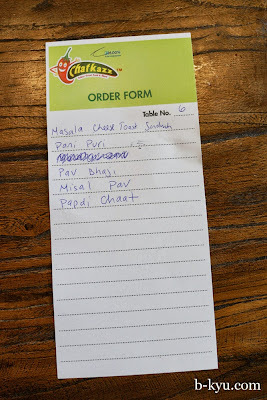 The DIY order forms make it easy to order, even overorder, as was the case for us. 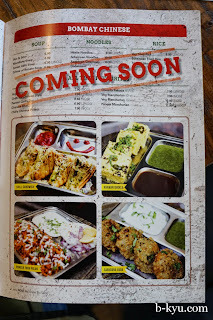 When there are so many new things on the menu to try, it's really hard to restrain. 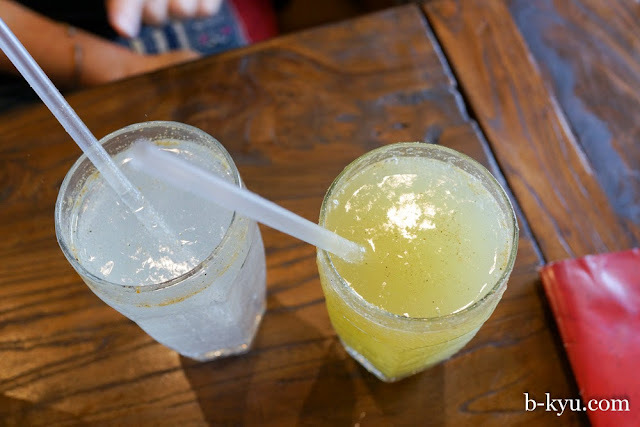 Masala lemonade and aadu nimu fodina - $3.90 each. Soda lived up with a judicious sprinkle of Indian spices. 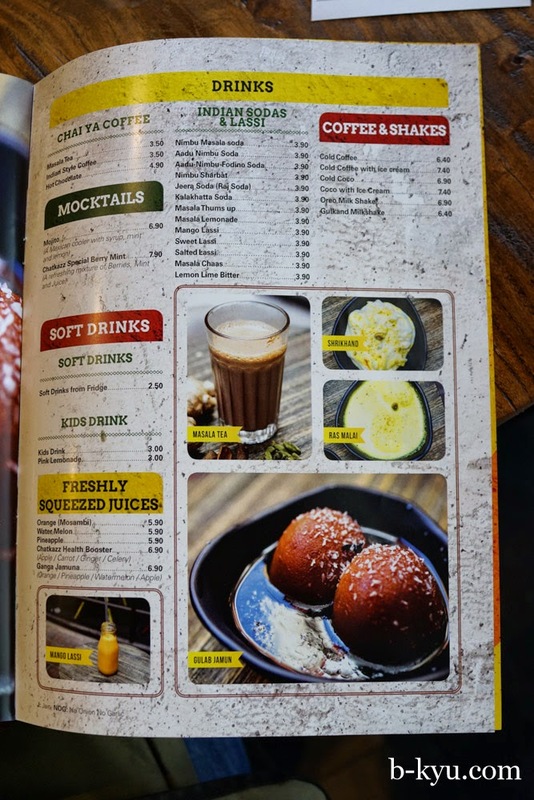 Gulkand milkshake - $6.40. 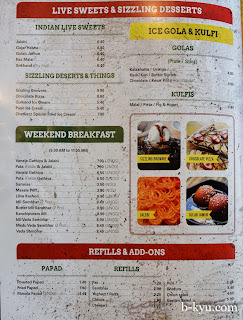 Wikipedia says gulkand is a sweet preserve of rose petals. The shake tasted like it had some ginger biscuits and Indian spices thrown in, awesome. 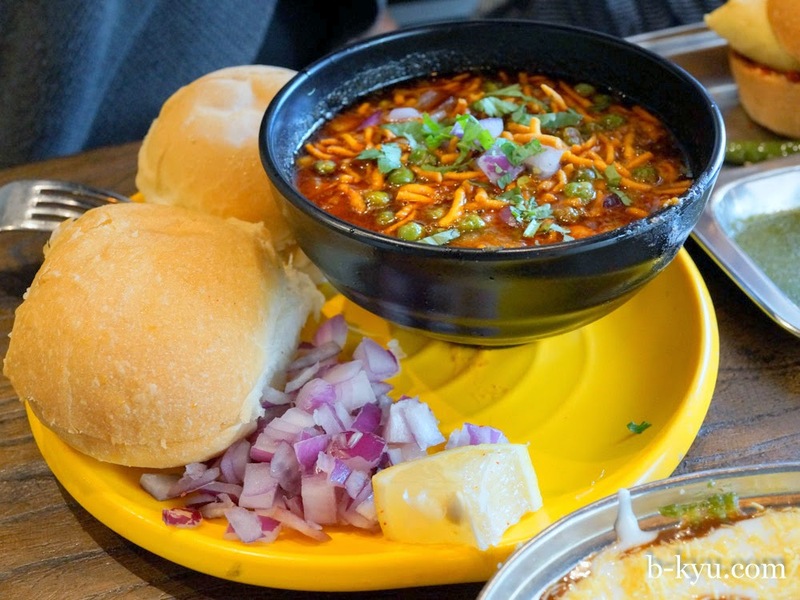 Misal pav - $10.90. 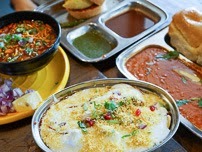 A fairly spicy bean curry topped with noodles and bread rolls for dunkage on the side. 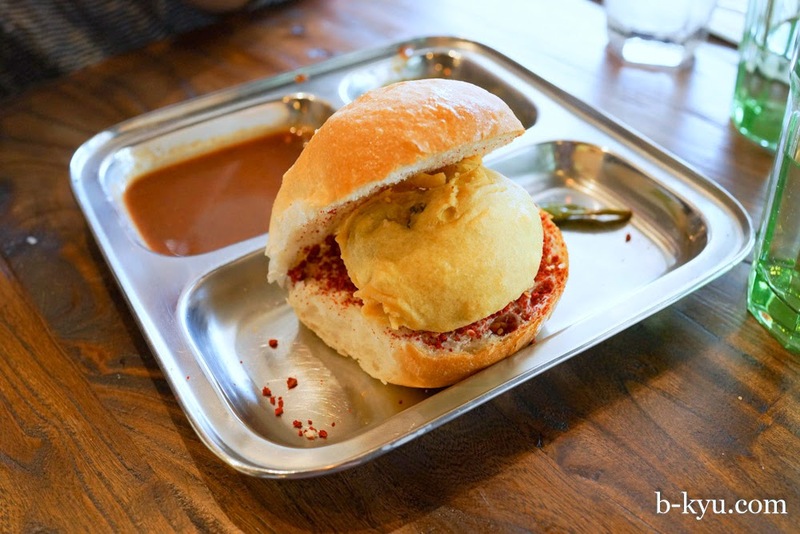 Vada pav Bombay - $5.50. Fried potato in a bun, with a little chili for good measure, and dunky sauce on the side. 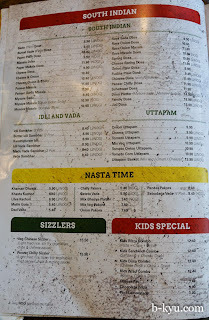 Papdi chaat - $7.90. 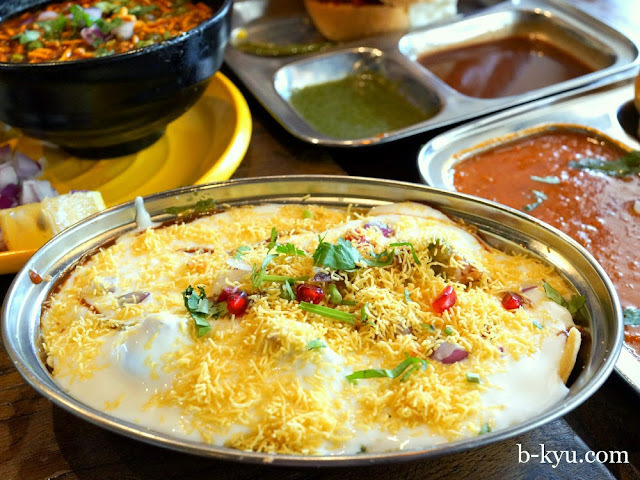 This dish got the most thumbs up - savoury crackers and chutney covered with yoghurt and a sprinkle of cheese for good measure. 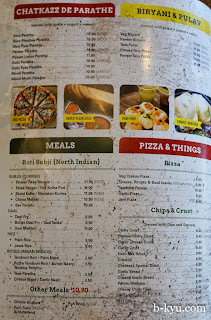 Pav Bhaji - $10.90. A tomato-y curry that is lightly spiced and dunking the bread rolls in. Served with a knob of butter. 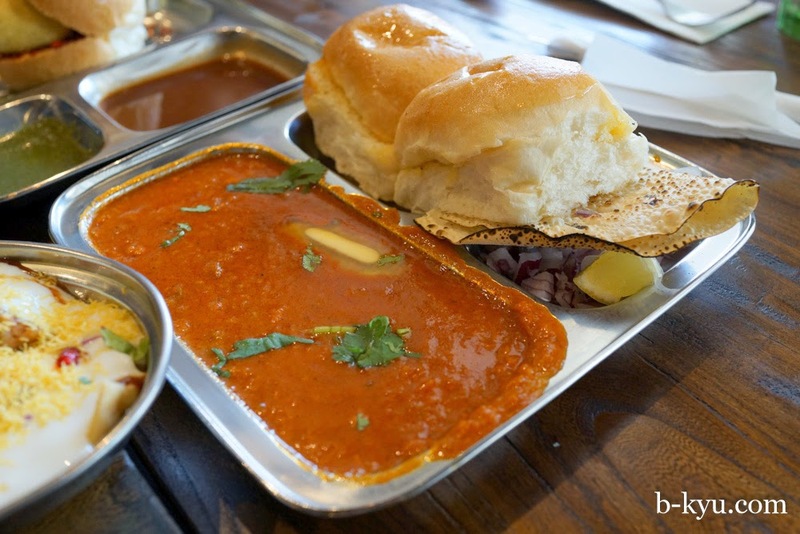 Wikipedia tells us pav bhaji is a popular fast food. 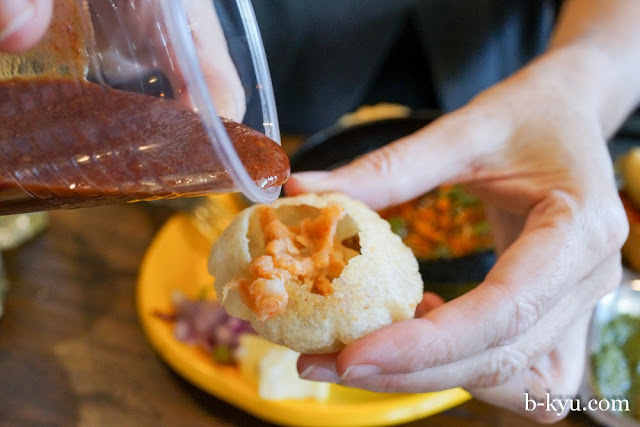 Pani puri gol gappa - $5.90. Crisp bread puffs filled with mystery goodies. 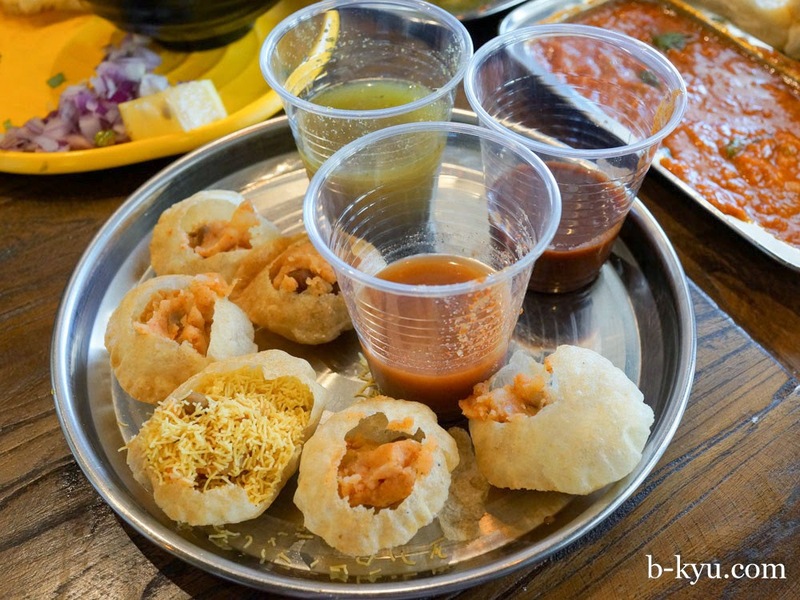 We've had these before at Fuska House, a Bangladeshi street food restaurant in Lakemba. 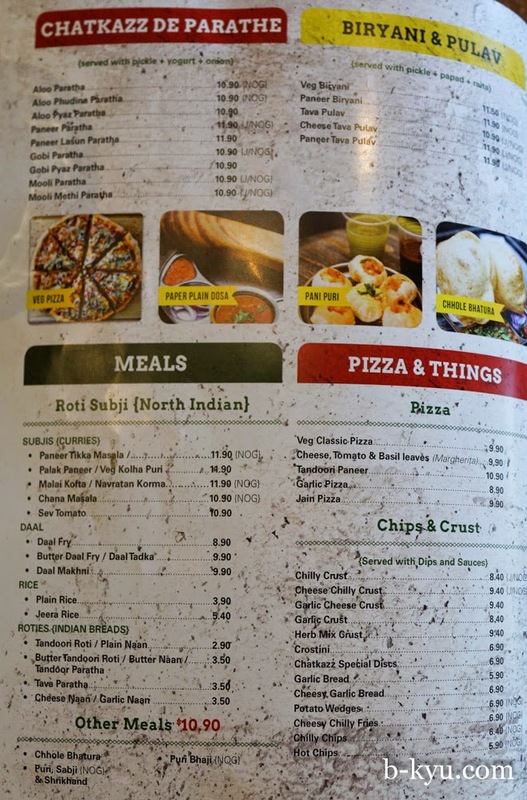 Serving suggestion. 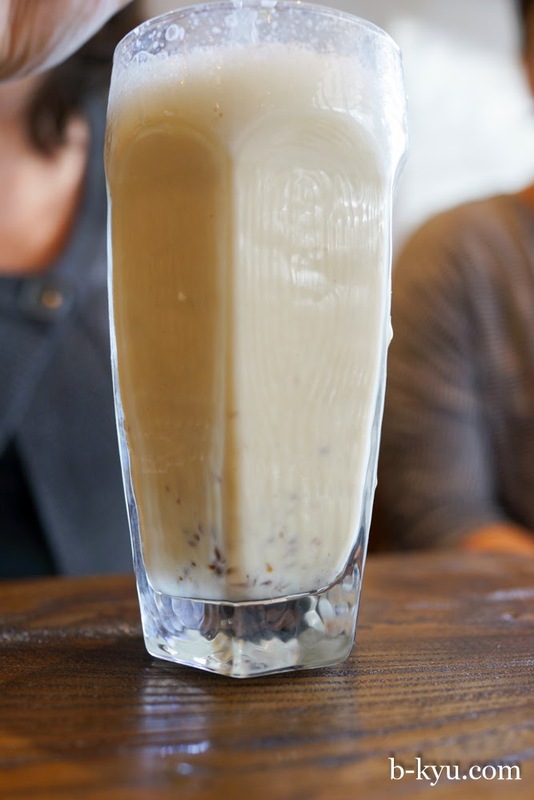 We could just tell you to pour the sauce but for some reason we have to photograph it as well. 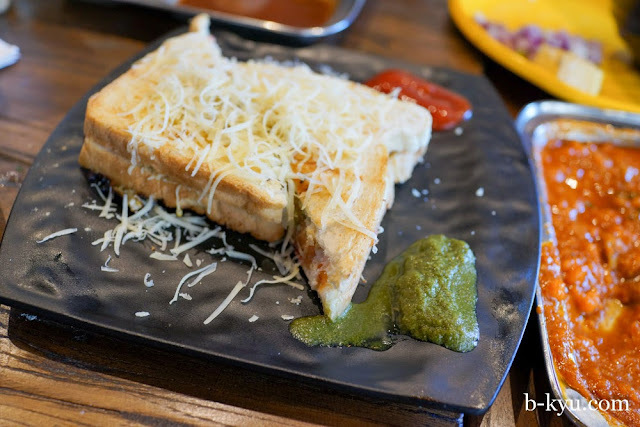 Masala cheese sandwich - $8.90. Comes with a splash of ketchup plus a hot and fresh tasting green chili sauce. 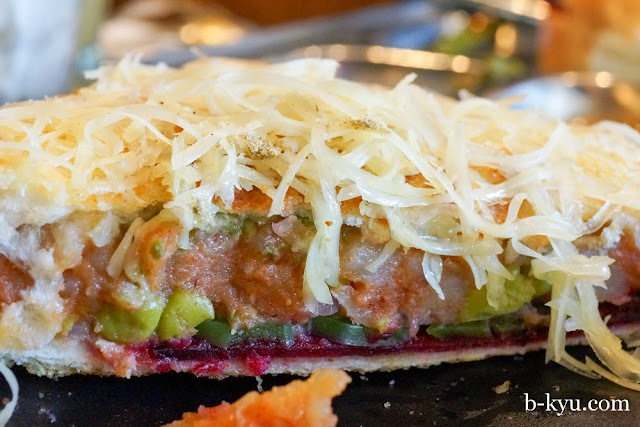 The masala cheese sandwich looks like an Aussie salad sambo on the inside, complete with betroot. 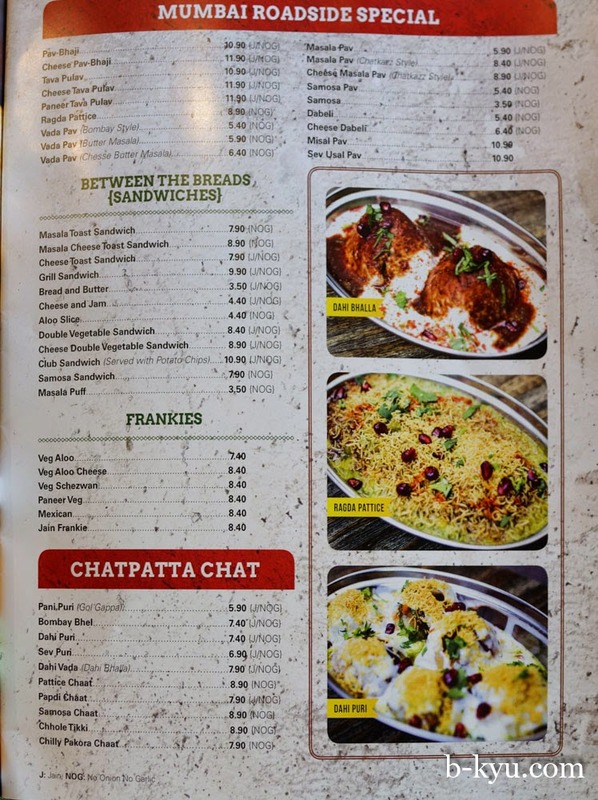 Chatkazz menu, click to enlarge. We thought the queue would have died down by the time we left, but it was even bigger, folks were sitting down for the long haul. 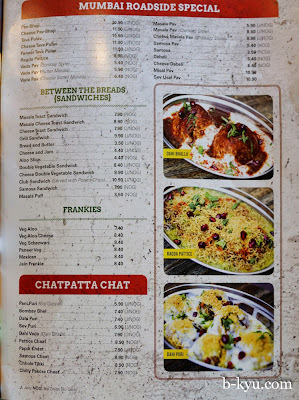 Chatkazz is a 4/14-20 Station Street East, Harris Park. Phone 8677 0033. 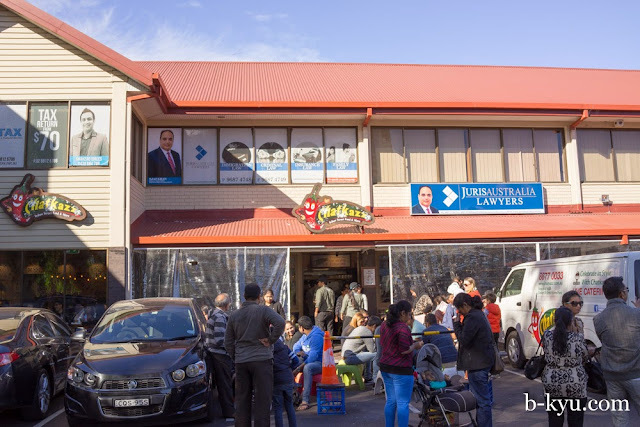 Also very handy if you need a lawyer or your tax done.